Can Healing Pendulums Be Worn as Jewelry? Any pendulums that have been dedicated to the service of healing are best not worn as decorative jewelry. If your pendulum is made from gemstones, just know that crystal energies can be too overwhelming to comfortably wear next to your body. Some people are extremely sensitive to crystal vibrations. Crystal energies can feel too draining or, the opposite, too highly charged. But the wearer may not realize it is actually the stone she is wearing that is causing her to feel out-of-sync. Fluorite is extremely helpful to have nearby if you are going to be around someone who tends to spew out negative statements. It absorbs the negative vibrations so that you are better protected from any verbal barbs. Better to avoid being around these types of individuals, but sometimes it cannot be avoided. Also, be kind to your crystals by periodically clearing or cleaning them of picked up energies. There are some lovely blown glass and metal pendulums fashioned into pendants to be worn around the neck. These are actually small vials which can be used to carry essential oils. These are not meant to be used for divination but could be. 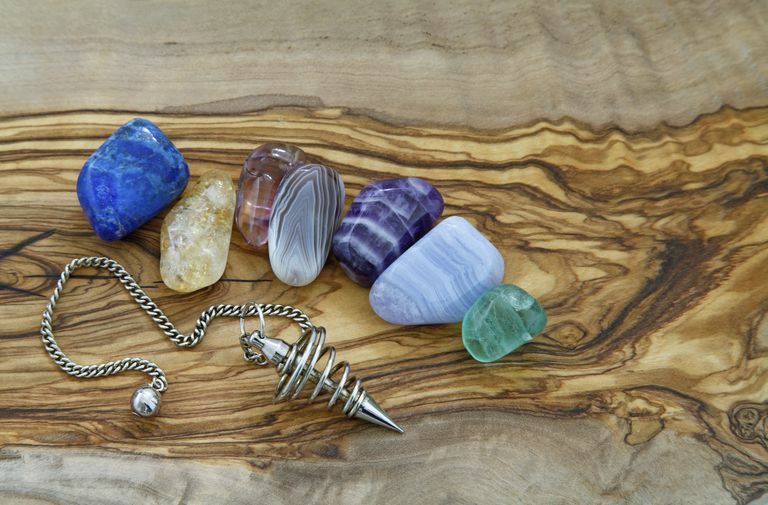 We prefer not to use pendulums made from gemstones as tools for divining information when working with clients. If a crystal pendulum is to be used as a healing tool for divination purposes then it is important to understand that crystals house healing properties. These energies could make possibly cloud the interpretation of the pendulum reading.